The FF4 and X-Men have found themselves on opposite sides. The fight takes place outside the Xavier Institute. Dust and Sue find themselves face to face. To the death, who wins? Sue puts herself in a bubble with no way for Dust to get in. Then she puts Dust in a bubble she can't get out of. Can go either way for me. Dust. She could take away Sue's invisibility. "Dust. She could take away Sue's invisibility." Since she could cover Sue with Sand? Hencforth not making her invisible? Maybe? Since she could cover Sue with Sand? Hencforth not making her invisible? Maybe?" That's assuming she knows where Sue is to begin with.But I guess your right she could.I thought you were saying dust could...take her powers.You have to remeber though that Sue can put up a forcefield that Dust couldn't get into.She kept the Void out,i'm sure Dust couldn't get in. "Sue puts herself in a bubble with no way for Dust to get in. Then she puts Dust in a bubble she can't get out of." Can she put herself and Dust in a bubble before Dust transforms? At this point it becomes a matter of who can get off first." That's why I say: It can go either way. That's assuming she knows where Sue is to begin with.But I guess your right she could.I thought you were saying dust could...take her powers.You have to remeber though that Sue can put up a forcefield that Dust couldn't get into.She kept the Void out,i'm sure Dust couldn't get in." And then Dust covers the bubble with sand, so Sue couldn't see. Even if she doesn't trap Dust right away, she's still safe from anything Dust can do. Then it's just a matter of catching dust from behind the safety of her force field. She can take as much time as she wants to grab up the rest. I don't think she even needs to get all of Dust, just a good majority. "And then Dust covers the bubble with sand, so Sue couldn't see." And then Sue puts up a bubble around her first bubble (and Dust) trapping her in the space between the bubbles. She can then shape her force fields however she wants and leave Dust trapped while she goes on fighting. Can she put herself and Dust in a bubble before Dust transforms? At this point it becomes a matter of who can get off first. And then Dust covers the bubble with sand, so Sue couldn't see." Why would she need to see when here opponent can't touch her? "I think this one goes to Sue now.Because she is the smarter one of the two.Dust is still in training.Yes they are both powerful and can have lots of attacks in there arsenal but it all comes down to who can come to the realization of how to beat the other the fastest.I think the answer is Sue." Even if she doesn't trap Dust right away, she's still safe from anything Dust can do. Then it's just a matter of catching dust from behind the safety of her force field. She can take as much time as she wants to grab up the rest. I don't think she even needs to get all of Dust, just a good majority." I can agree with that. But is that the first thing she does? What I mean is: What if she doesn't go for the bubble defense and instead, chooses to go invisible. (not knowing what Dust's abilities are) Remember, Dust can transform into grains so fine that its invisible to the naked eye, and can move at good speed. (not sure if its superhuman or not) If Dust can get even a tiny portion close enough to Sue before she puts her bubble up, its over. I think this one goes to Sue now.Because she is the smarter one of the two.Dust is still in training.Yes they are both powerful and can have lots of attacks in there arsenal but it all comes down to who can come to the realization of how to beat the other the fastest.I think the answer is Sue. In the middle of a fight, Sue is more likely to go with force field. Stealth won't help her and she can do so much more with force fields than she can while invisible. And even if it's not the most likely thing for her to do, it's something easily within her power and something she does regularly so it's a valid scenario. Anyway, putting up her force field is something I can almost she can do before Dust can not only turn into dust, but move all her Dust to where Sue is. Even if she can turn to Dust as fast as thought (which I don't know about) she still has to get over to Sue, whereas Sue just has to think to have her perfect defense. And even assuming Dust gets a little bit of her sand in, do you have anything to show she could control a little bit of her sand when it's not connected to the rest of her? And that would only work if Sue made a force bubble kind of thing, a barrier around her but not right on her. She could just as easily make one that's skin tight, leaving no space for Dust. "In the middle of a fight, Sue is more likely to go with force field. Stealth won't help her and she can do so much more with force fields than she can while invisible. And even if it's not the most likely thing for her to do, it's something easily within her power and something she does regularly so it's a valid scenario. Anyway, putting up her force field is something I can almost she can do before Dust can not only turn into dust, but move all her Dust to where Sue is. Even if she can turn to Dust as fast as thought (which I don't know about) she still has to get over to Sue, whereas Sue just has to think to have her perfect defense. And even assuming Dust gets a little bit of her sand in, do you have anything to show she could control a little bit of her sand when it's not connected to the rest of her? 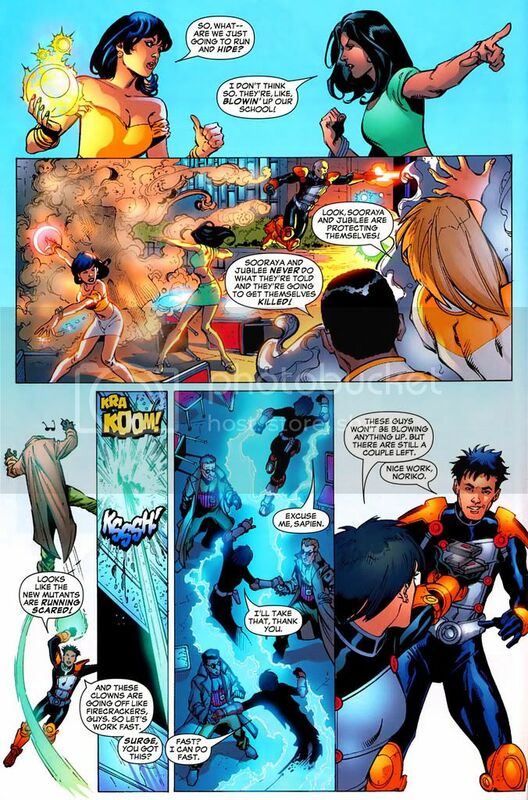 And that would only work if Sue made a force bubble kind of thing, a barrier around her but not right on her. She could just as easily make one that's skin tight, leaving no space for Dust." Dust's ability seem to be instantaneous. She doesn't need to transform her entire body. As for the part about controlling sand not connected to her body. But I must admit I have no counter for Sue's bubbles. As you pointed out they would more then likely already be up, rendering Dust's offensives capabilities useless. I dont know if putting Dust in a bubble would kill her though. I don't believe (do to the nature of her powers) that she needs to breath like regular people. But thats speculation on my part. Where is the battle going on at? What I meant about controlling sand not connected to her body was in response to you saying it would be over if she could get a tiny portion near Sue. Have you seen her control a "tiny portion" of sand completely independent of her body? How fine is her control? Can she manipulate just a few grains of sand by themselves? If she gets a handful of sand into the bubble and it's cut off from the rest of her, can she control it? I've read all of New X-Men but I don't recall something like that. I don't see her being fast enough to turn to sand and get over to Sue before she gets her force field up anyway (her being faster than Jubilee in that scan, when Jubilee wasn't even trying to fight her, isn't enough for me), but if she can, I'd need to know the extent of her control. As for Sue not killing Dust, she doesn't have to. Trapping her in a box she can't get out of seems like a win. "What I meant about controlling sand not connected to her body was in response to you saying it would be over if she could get a tiny portion near Sue. Have you seen her control a "tiny portion" of sand completely independent of her body? " Isn't that what the second scan shows? Her controlling sand independent of her body? What I meant by tiny portion was, it wouldn't have to be all of her. I didn't mean a few grains. But as a living sand storm a tiny portion could be like just her arm or leg. Since you've read all the New X-Men you know she can manipulate her size while transformed. "If she gets a handful of sand into the bubble and it's cut off from the rest of her, can she control it? " That I don't know. But again I reference the second scan. It appears to me that she's controlling sand not attached to her body.
" I don't see her being fast enough to turn to sand and get over to Sue before she gets her force field up anyway (her being faster than Jubilee in that scan, when Jubilee wasn't even trying to fight her, isn't enough for me)"
"As for Sue not killing Dust, she doesn't have to. Trapping her in a box she can't get out of seems like a win." I agree it would. But I stated in the opening it was to the death. I say Sue Richards take this fight. I am not sure what Dust can do to Sue if she generates her Force Field. By not attached I mean separated by a barrier. Sue, Magneto, and many telekinetics use force fields very rarely, if ever (I've never seen it but that doesn't mean it hasn't happened) seen people manipulate things through them. So to clarify, see anything showing her control her sand through a barrier? Also, there are several mutants that struggle with fine control of their powers. You're talking about how fast it was, but can you accurately gauge time from that page? I'm by no means saying she's slow (I've seen otherwise), but do you have something a little more solid than that to suggest that she could turn to sand and travel a distance (a few feet, a few yards, more? Jubilee is standing right in front of her in that scan) before Sue can think "force field"? And also, Jubilee defending herself does make a difference. 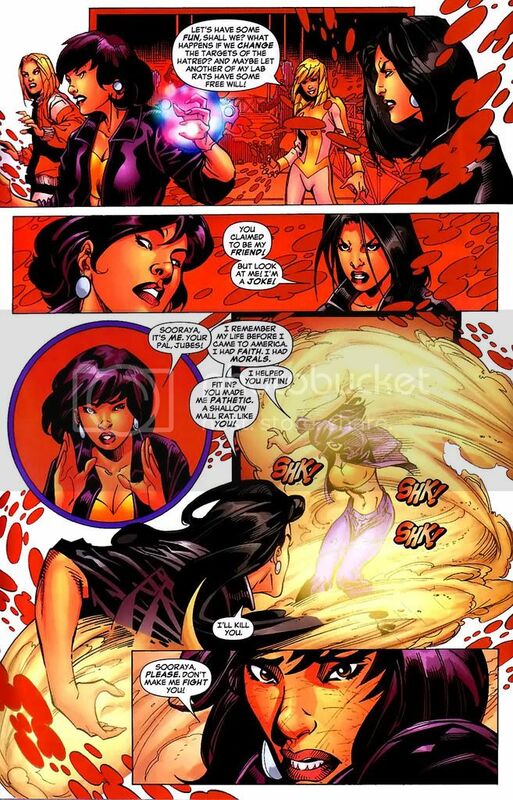 Jubilee is capable of quickly activating her powers so if she were defending herself and powered up some glowy bubbles, it would be a better gauge of time. If it was like a showdown-ish situation where she beat her to the draw, it would a better example of speed. I understand that it's to the death, but if they're in a position where Sue is totally protected and Dust is in an inescapable trap, I think it's good enough. If you want death though, she could launch her into space, send her to the Earth's core, throw her in the ocean and sea if she control her sand when it becomes mud under , give her to Johnny (since they're all together in your scenario) to incinerate, make countless separations in the box and scatter Dust all over the world, compress her into a diamond, etc, etc. This woulda been a little fancier but I gotta go. I'll see if I can find a better representation of her speed. Also if we add Johnny then we start adding other people and it becomes a FF4 vs the X-Men. This is a tough one because each one has a known weakness. But if I will have to choose, it will be Sue Richards. More control and knowledge of her powers. She can do multiple force fields that can trap and eliminate Dust. If my research is right, Dust can only make her self into sand and not summon or create sand, so it is one of the possible weakness that can be against her. I also forgot to mention, Sue Richards have an automatic response to threat by creating force field around her so if there are sudden attacks, she body reacts to it automatically. "I'll see if I can find a better representation of her speed.Also if we add Johnny then we start adding other people and it becomes a FF4 vs the X-Men." I don't think her speed matters (unless of course you can prove it to be substantially superhuman) because if both of their changes (to dust form and creation of a force field) are as fast as they think (in Sue's case, the change is more instinctive, so even faster, but w/e), then Sue wins. She doesn't have to do anything but think, while Dust has to think and then move. And you already had it being FF4 vs the X-Men. That was the scenario you created. But in any case, that's just one method of several I mentioned. If you don't like it, pick another. Yeah thats what I meant Buck. Not a single person brought any other character into the discussion. I said the FF4 and X-Men have found themselves on opposite sides. Clearly thats just dressing. The fight itself focuses on Dust and Sue. But if you need the Human Torch in your scenario to finish off Dust I'm all for it. Sue's a smart girl, and her powers are incredible. As Buckshot stated before, Sue can and WILL put herself in a protective bubble and trap Dust in a Bubble too. Sue's quick on her feet and has shown the ability to be a quick thinker. She was able to create a protective shield for herself and the rest of the FF right before a Nuclear bomb went off and saved all of them. Dust is lightweight for her. Did you miss what I said? "But in any case, that's just one method of several I mentioned. If you don't like it, pick another." I used it because it was in the scenario you created. It may just be "dressing" but I thought it was fair use. People set up fights in cities and the environment (especially when people start talking about Spider-Man for some reason) is always usable. But as I said, pick another one if you don't want to see Johnny. Sue can kill Dust whether he's there or not, he's not necessary. "Sue's a smart girl, and her powers are incredible. As Buckshot stated before, Sue can and ***WILL*** put herself in a protective bubble and trap Dust in a Bubble too. Sue's quick on her feet and has shown the ability to be a quick thinker. She was able to create a protective shield for herself and the rest of the FF right before a Nuclear bomb went off and saved all of them. Dust is lightweight for her." Again I ask, what does putting Dust in a protective bubble do? I used it because it was in the scenario you created. It may just be "dressing" but I thought it was fair use. People set up fights in cities and the environment (especially when people start talking about Spider-Man for some reason) is always usable. But as I said, pick another one if you don't want to see Johnny. Sue can kill Dust whether he's there or not, he's not necessary. " What was one of your other scenarios? I must have missed them. And if thats what its gonna be, then lets roll with it. Iceman takes out Human Torch, Colossus and Thing battle on, Emma and Charles drop Reed with telepathy and use him as a hostage, forcing Sue to drop her shield. Dust moves in for the kill. Game over. Again I ask, what does putting Dust in a protective bubble do? " It basically incompacitates her. If Dust cannot move, what's she going to do? Sit there and do nothing. Or if Sue wants, she cans compress her molecules tightly or launch her into space, or put her in water. There're limitless possibilities. It basically incompacitates her. If Dust cannot move, what's she going to do? Sit there and do nothing. Or if Sue wants, she cans compress her molecules tightly or launch her into space, or put her in water. There're limitless possibilities." Whats the largest bubble Sue's ever created? Cause Dust can grow to be pretty big and wide spread. She can become so fine that its naked to the eye, how do you trap something you cant see? "What was one of your other scenarios? I must have missed them." "I understand that it's to the death, but if they're in a position where Sue is totally protected and Dust is in an inescapable trap, I think it's good enough. If you want death though, she could launch her into space, send her to the Earth's core, throw her in the ocean and sea if she control her sand when it becomes mud under, give her to Johnny (since they're all together in your scenario) to incinerate, make countless separations in the box and scatter Dust all over the world, compress her into a diamond, etc, etc." "And if thats what its gonna be, then lets roll with it. Iceman takes out Human Torch, Colossus and Thing battle on, Emma and Charles drop Reed with telepathy and use him as a hostage, forcing Sue to drop her shield. Dust moves in for the kill. Game over." How what's gonna be? For the last few posts I've been telling you that we could use another way if you wanted. Don't act like I'm pressing the Human Torch issue. Well ya kinda where Buck. You brought em up, not me. But okay, I'll ask you the same thing I asked EC. 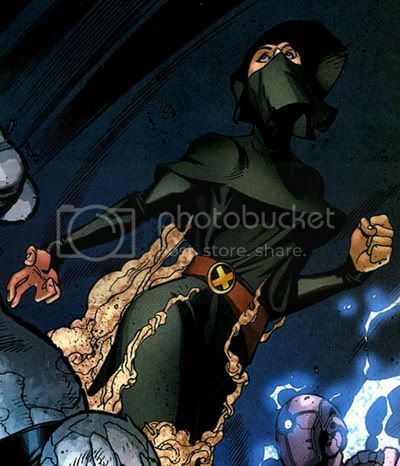 How does Sue trap a sand storm? I know she's faced the Sandman and never encased him in a bubble. Isn't Dust basically the same character? Whats the largest bubble Sue's ever created? Cause Dust can grow to be pretty big and wide spread. She can become so fine that its naked to the eye, how do you trap something you cant see?" I've seen Susan create pretty big bubbles before. The largest one I've seen her make before was between 10-20 meters and she wasn't trying, she was halfway unconcious. Arguably, Sue can and make a spinning wheel thing that will absorb Dust.
" I know she's faced the Sandman and never encased him in a bubble. Isn't Dust basically the same character?" They didn't want to do that because it would basically be boring. Kinda like Spider-Man stopping everybody easily and getting hit when he shouldn't, or Superman actually getting hurt by certain things. It's done for the story. I've seen Susan create pretty big bubbles before. The largest one I've seen her make before was between 10-20 meters and she wasn't trying, she was halfway unconcious. Arguably, Sue can and make a spinning wheel thing that will absorb Dust." Yeah I just saw a scan if her engulfing a massive tidal wave. Well got me. They didn't want to do that because it would basically be boring. Kinda like Spider-Man stopping everybody easily and getting hit when he shouldn't, or Superman actually getting hurt by certain things. It's done for the story." Maybe, maybe not. This seems to be a growing trend now, that everything can be explained away as doing it for the story. Not saying it isn't true but it doesn't apply to everything. Maybe, maybe not. This seems to be a growing trend now, that everything can be explained away as doing it for the story. Not saying it isn't true but it doesn't apply to everything." That's true, but when certain showing are considered along with powers, you can't really blame it on anything else, BUT writing. "Well ya kinda where Buck. You brought em up, not me. But okay, I'll ask you the same thing I asked EC. How does Sue trap a sand storm? I know she's faced the Sandman and never encased him in a bubble. Isn't Dust basically the same character?" I don't believe I was. Things like, "But in any case, that's just one method of several I mentioned. If you don't like it, pick another", "But as I said, pick another one if you don't want to see Johnny. Sue can kill Dust whether he's there or not, he's not necessary", and several other options in the original post, seemed to me to be a clear method of giving you other options. But that's me. How would she trap her? Well, she could always just cover the area - not being taken up by her allies - in a force field and shrink it. Starting with a bigger area instead of trying to grab just Dust individually would make it very easy. She could also just make a bubble 10 feet around Dust since when Dust turns to sand she generally stays in one mass instead of spreading out everywhere with the express purpose of not being contained. Sue could also make a fan or something to pull Dust where she wants her. Sue could also do what I mentioned before; when Dust tries to get her and presses up against the bubble Sue is in, she just makes a bigger bubble around that one. And all of the force fields are invisible so Dust won't even see it coming. Just because Sue never did it to sandman doesn't mean she can't or won't do it here. It's a viable tactic and is perfectly within her range of abilities. And if you want to start an "out of character" thing, you already have them killing, something neither of them jumps to do. If you're talking about the same tidal wave I'm thinking of, she was amped for that. Not that it matters though. Put in mind what Sue Richards can imagine with her powers, it can happen thats also the limits of her force field. Dust can bite into that one if she can. "fan or something to pull Dust where she wants her." Similar to what I said. The vacum/tornado thing. It's weird to be on the same side as you. Almost... unnatural.